After some initial work comparing the numbers of people who own business in the UK, Co-operatives UK has just completed a report now out on Global Business Ownership, which compares the number of people who have an ownership stake of co-operative enterprise with those who have an ownership stake through company shares. It is the first statistical analysis to compare co-operative and conventional business ownership worldwide. All the proper qualifications you would expect for this kind of analysis apply, but the findings are fascinating. There are three times as many member owners of co-operatives as individual shareholders worldwide. There are 328 million people who own shares, compared to 1 billion who are member owners of co-operative enterprises. There are three countries with over half the population in co-operative membership and are all in Europe. These are Ireland (70%), Finland (60%) and Austria (59%). But the countries with the most significant numbers of people in co-operative membership, however, are predominantly in Asia and the Americas. These are India (242 million), China (160 million) and the USA (120 million). One in five people across the Americas, North and South, are a member of a co-operative. In Africa, one in thirteen people is a member of a co-operative and there are six times as many co-operative owners as there are shareholders. The country with the widest shareholder ownership across its population is Japan (31%). In Japan, this has doubled over the past two decades, whereas in the UK, individual share ownership, compared to other institutional investors, has halved. Meanwhile, in the fast-growing BRIC countries (Brazil, Russia, India and China), there are four times as many co-operative members as direct shareholders. 15% of their population are co-operative members, compared to only 3.8% who are shareholders. Of course, there is also a very significant dispersed ownership worldwide across a variety of non- listed enterprises, family firms and micro-enterprises. In a tough economy, mass ownership is a perfect business strategy because you have your customers and workers onside. Ownership is best shared, not divided. Plan C for the British economy is about a radical dose of democracy for the economy, spreading ownership and giving the people involved in a business the right to benefit from its success. You can sign up to join in on the Guardian site – and take part in the UK national launch for the United Nations International Year of Co-operatives. Happy new, co-operative year. I am not going get tired of that idea for some time to come! Many years ago, we made a big step forward in the campaign on international debt when the Pope signed up, opening the way for Catholic churches around the world to come behind the Jubilee campaign. 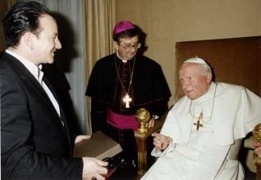 Bono made it a meeting to remember when he handed the leader of the catholic faith worldwide his own sunglasses to wear, praising him as a funky Pope. The co-operative movement worldwide has now received a boost from Pope Benedict XVI, who says co-operatives have “evangelical ideals” which make a valuable contribution to the community. The Pope addressed a congregation of over 3,000 Italian co-operators gathered at the Vatican Basilica. I am looking forward to contributing once more to a course this year at Schumacher College. The course is a pioneering attempt to bring together an MSC on economics as if people mattered, in Fritz Schumacher’s phrase (it was the subtitle to his book, Small is Beautiful, though the title itself was coined by his publisher). The course details are now out.